Extra-vision design features 35" of display height! 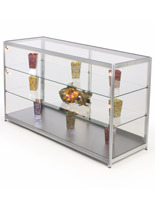 Four 20-watt halogen lights illuminate displayed merchandise! 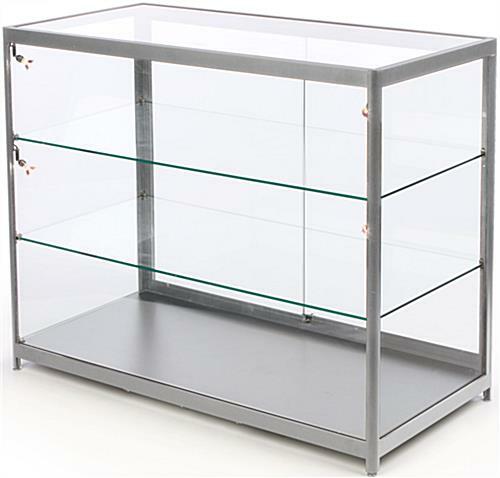 Full tempered glass design is safer than traditional annealed glass! 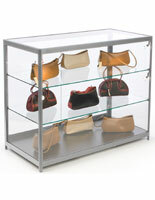 These cash counters that measure 48" wide offer a retail store a simple, fully functional showcase at a great price. 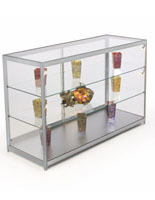 Each fixture features an extra-vision design, offering a full 35" of display height. 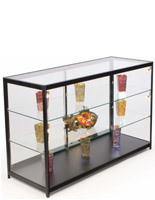 Affordable cash counters, also known as glass cashwraps, are perfect for displaying jewelry, electronics, pocketbooks, fine china, glassware, sports memorabilia and much more. 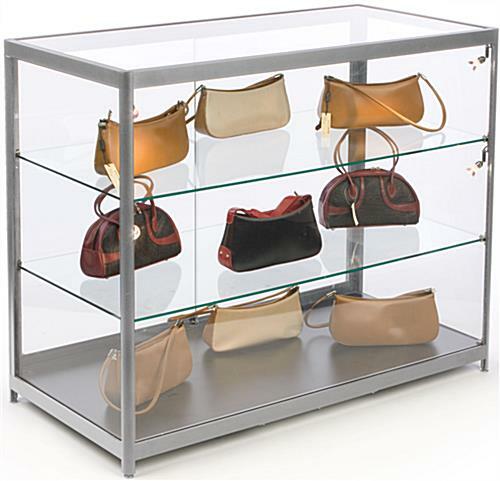 These store fixtures are often found used in a wide array of environments, from department store or boutique locations to jewelry store, gift shops, school, or business lobby locations. 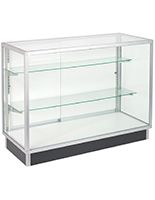 These glass cashwraps, retail cash counters feature a tempered glass and aluminum extrusion construction for durability. Each store fixture also features four positionable 20-watt halogen lights, with an easily accessible on/off switch (located just inside the sliding doors). Floor levelers ensure stability on uneven surfaces. 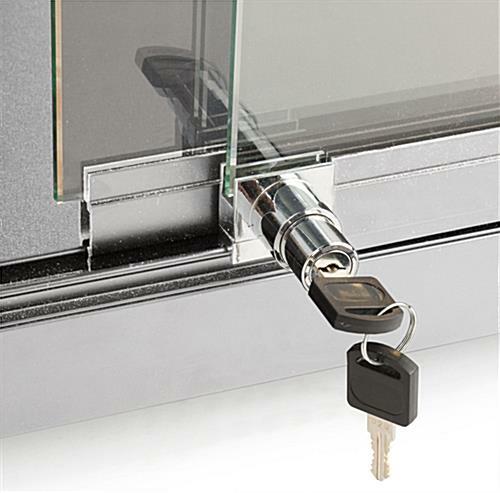 Rear sliding doors feature a plunger lock to ensure the safety of displayed items. 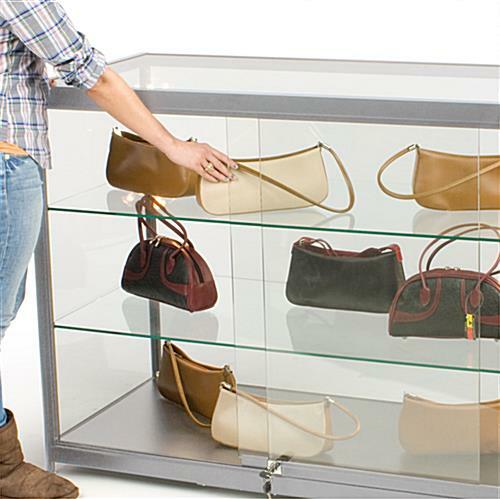 These doors run the entire height and width of the cash counters, offering a 21-3/4" wide opening in which to insert and remove merchandise. 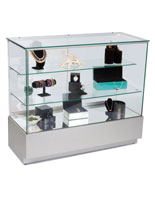 These cash counters that have a silver extrusion are the perfect fixtures for displaying items of varying heights, as both full-length glass shelves are height-adjustable. Retail cashwraps provide a centralized area to display items in a retail store. 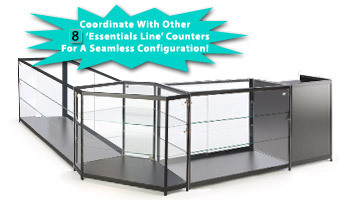 Cash counters that ship fully assembled, such as the ones seen here, save store locations hours of assembly time. 48.0" x 38.0" x 23.8"
Thanks for the feedback, John! If you need any assistance, our customer care representatives will always be happy to help you out!